Pitch A=440 at 3” w.p. Total width of the instrument is c.140”. The height from the floor to the top of the tallest façade pipes is 224.5”. The height from the floor the tops of the “average” façade pipes is 206”. The height from the floor to the top of the swell enclosure is 156”. The depth of the instrument from the rear to the front of case is 122”, including a 10” walkboard at the rear of the Swell enclosure. The console projects c.40” from the front of the case. There are 35 pipes in the main façade of painted zinc, arranged in 3 flats 5-15-5. . Pipes 1-10 of the Great 8’ Open Diapason were relocated from the façade to within the instrument. They were originally located in side wings to the main case, and in their original position probably did not add to the total height of the instrument. 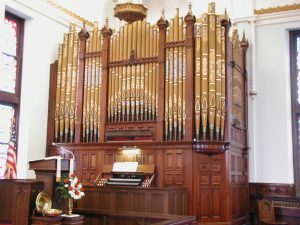 From its construction in 1886 until its acquisition by Buzard Pipe Organ Builders in 2002, this organ served the congregation of Wesley Chapel Methodist Church in Cincinnati, OH. That organ was moved to the congregation’s second home in 1973, at which time the configuration of the instrument was slightly altered. The impost and façade were taken off the main case and placed on the floor to the right of it. The original winding system was replaced with a Spencer Orgoblo and three modern reservoirs. The original 27-note pedalboard was replaced with a modern 32-note one. At the time of removal from the church, the organ was in good playing condition. The instrument has been completely disassembled and inspected in our factory, and mechanical restoration is ongoing. Before reinstallation, the following work will be performed. Windchests. All four windchests (one Swell, one Great, and two Pedal) will be completely restored. Note channels and sponsil areas will be flooded with glue. New felt/leather coverings will be installed on the pallets. New rubber cloth will be installed on the underside of the windchests. Pallet springs will be renewed. Chest top tables will be planed true. Bearers will be checked for proper thickness and shimmed as appropriate. Chest table top surfaces, sliders and toeboard bottoms will be graphited. Rackboards and rack pillars will be cleaned, repaired, and refinished as necessary. necessary. Any broken or missing parts will be replicated. All felted bushing points will be renewed. All threaded brass wires will be inspected and cleaned, and replaced as necessary. All new leather nuts and bushing cloth washers will be installed throughout the action. The manual keyboards and pedalboard will be completely rebushed, with new key coverings as required. A 27-note pedalboard in the style of the original will be fabricated and installed. Wind system. The original reservoir was removed from the organ at some point in the past. Buzard has acquired a Felgemaker reservoir of appropriate capacity and dimensions, which will be restored and installed within the base of the instrument. The existing blower and enclosure can be retained, or a new, more silent blower can be provided. Pipework. The zinc tuning scrolls on the 35 façade pipes will be cut out and replaced with new, felted spotted metal inserts soldered in place. The collapsed toes on these pipes will be replaced with new cast lead toes. All pipes will be cleaned. Slide tuners will be checked for proper tightness and replaced as necessary. Stopped pipes will have their stopper packing replaced. All pipes will be inspected, dents removed, split seams resoldered, and all pipes will be bench voiced and regulated. Casework. The existing casework will be cleaned, repaired, and returned to its original configuration with the main flat of façade pipes located above the impost above the keydesk. If the organ is to be installed in its new home without the need for casework at the sides, the present casework will be sufficient. If the organ will require side casework, Buzard has acquired surplus casework from another Felgemaker organ which will be fitted to this instrument. Delivery and installation. After completely setting up the organ in our factory, it will be carefully disassembled and packed for shipment. The organ will be delivered and installed in its new home, with final tuning and regulation completed on site. 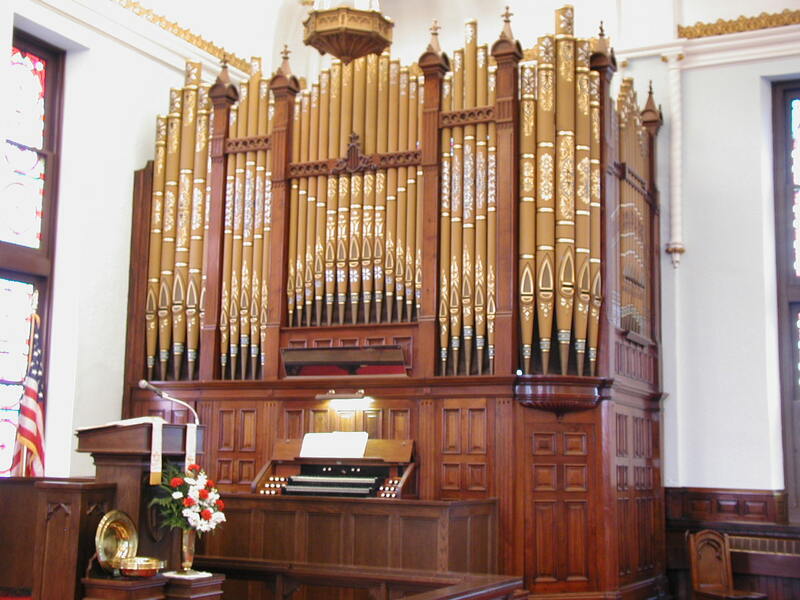 The organ will be guaranteed for ten years from the date of completion of installation, provided that the organ is maintained by Buzard Pipe Organ Builders or its designated representatives during the warranty period. Price will include all factory work, and the work of our crew on site during installation. Per diem expenses for the installation crew, plus actual delivery costs for the instrument, will be billed separately. Repainting of the façade pipes. 8’ Trumpet on the Great. 4’ Principal on the Swell. *Buzard has acquired Felgemaker pipes for these stops.